The long journey to get here began with our Tuesday night Dinners, where Brandi would cook a meal in my studio apartment on 7th st in Los Angeles and I would deliver the meals to our friends for $7.99. 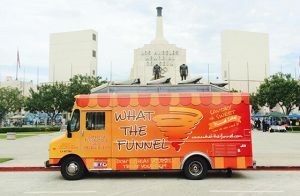 We then began selling funnel cakes and juice at festivals all over L.A. From there, we began catering for corporate events and large parties. We eventually got our own food truck, called What The Funnel, and hit the streets of Los Angeles; now, we are proud to serve you our delicious meals and desserts here at The Starving Actor Restaurant. It has been a long road, but we have savored every step of the journey. For that reason, we pay homage, on our walls, to the actors and actresses who have risked it all and sacrificed everything to accomplish their dreams. You might be wondering why we chose the name The Starving Actor. Chef and owner Brandi Burks is an accomplished playwright with 7 successful plays to her credit. Throughout her time directing and producing, she encountered hundreds of actors struggling to make it in the entertainment industry. Some could not afford gas to get to rehearsal, while others slept on random couches, but they all were hungry; for success and for a hot meal. Whether you are an Oscar winning actor or a young dreamer, at The Starving Actor, everybody eats like a star. Stay hungry!